The resumé of tenor saxophonist Jimmy Forrest is a long and impressive one. During his teens he honed his chops with The Jeter-Pillars Orchestra, a jazz outfit based in his home town, St. Louis, Missouri, then spent some time working with longtime riverboat pianist Fats Marable and toured with Texas-based bandleader Don Albert, all before the 1930s had come to an end. Forrest received much wider exposure when he joined the band of pianist and Decca recording artist Jay McShann, rubbing elbows with future icon Charlie Parker in 1941 and '42. After that he spent several years with Andy Kirk and his Twelve Clouds of Joy before serving a brief stint with Duke Ellington's ensemble, where some of the melodies created by the great genius of jazz lodged in his memory banks for use at a later date. In the early 1950s, Forrest put together his own band, billing the shifting lineup of backing musicians as his All Star Combo on subsequent record releases. In 1951 he signed with a newly-formed Chicago-based company, United Records. His first release, "Night Train," was the biggest hit the label ever had, racking up several weeks at number one on the R&B charts in March and April 1952. Forrest claimed sole authorship of the instrumental composition (first pressings of the record misspelled his name "Forest" while correctly displaying the name on the label's writer credits), but the tune was actually a blend of two passages from previous Duke-related recordings. 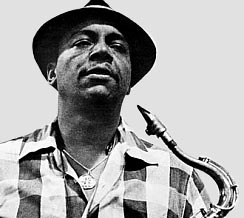 The first stanza was lifted from a 1940 recording, released on Bluebird, of "That's the Blues Old Man" by alto saxophonist Johnny Hodges and his Orchestra (his band credited on the label, in parentheses, as An Ellington Unit), which Hodges composed with Irving Mills. The second part of the song was adapted to sax from the piano riff that leads off Ellington's recording of "Happy Go Lucky Local" (from "The Deep South Suite"), released in 1946 on Musicraft. The trick was in the timing; the track does a slow burn climaxing with three low, uniformly raw notes unique to Jimmy's recording. No longer did he hide out as a near-anonymous member of some larger-than-life jazz band. Jimmy Forrest had become a star, albeit within the segregated restrictions of the African-American target audience; several months later, after his breakthrough hit had fallen off the charts, Buddy Morrow offered a solid big band rendition of the song on RCA Victor, getting some exposure with his trombone-led recording yet falling far short of Forrest's success with the song, restrictions or otherwise. Forrest's follow-up for United, "Big Dip," failed to catch on, but the third release, "Hey Mrs. Jones," with a collective band vocal and typically flirtatious lyrics ('...Would you care for a drink of my wine?...Say, Mrs. Jones, did I tell you that you're looking fine? '), returned him to the R&B top ten in December '52. He remained with United through 1955 but no further releases (including a sequel called "Mrs. Jones' Daughter") came close to repeating even the second hit's level of fleeting popularity. 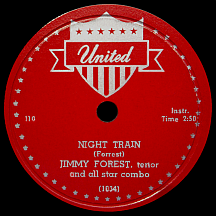 In 1955, Jimmy made a misguided attempt at reviving "Night Train" with a single on Dot, "Night Train Mambo," complete with Perez Prado-inspired grunts. He performed for several years with Count Basie trumpeter Harry "Sweets" Edison (also a Jeter-Pillars alumnus), recorded for jazz label Prestige in the 1960s and was a sideman with Basie's band in the '70s. A partnership with Al Grey, Basie's trombonist, resulted in some sweet sides made during the last few years of his life. Jimmy Forrest passed away in 1980 at the age of 60. The popularity of "Night Train" extended far beyond his 1952 hit record. Besides Morrow's cover version, the song was remade by Rusty Bryant in 1954 as an uptempo scorcher titled "All Nite Long" (a medley of "Night Train" and the Joe Houston track "All Night Long," with singalong shouts to heighten the frenzied atmosphere of his hybrid recording). Attempts were made by others to add lyrics to the composition, but the most successful remakes relied on the song's power as an instrumental. In the summer of 1960, The Viscounts rocked the tune, heavy on drums while utilizing band member Harry Haller's saxophone to emulate the sound of a train whistle. Richard Hayman recreated the song in 1961 as a rural harmonica piece. James Brown made a splash in the spring of '62 with a funked-up free-for-all highlighted by JB's shouting, conductor-style, the locations of various train station stops: 'Miami, Florida! Atlanta, Georgia! Raleigh, North Carolina! Washington, D.C.! Richmond, Virginia too! Baltimore, Maryland! Philadelphia...New York City...Boston, Massachusetts...and don't forget New Orleans, the Home of the Blues...oh yeah! Night Train! Night Train!' Not surprisingly, this fresh take on the tune was a major hit on both the pop and rhythm and blues charts. 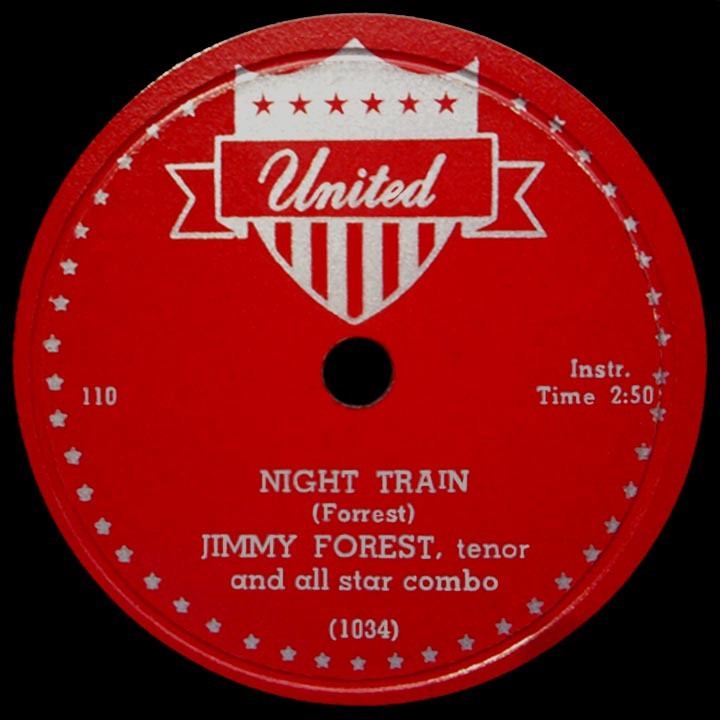 Of the many versions of "Night Train" throughout the years, Jimmy Forrest's original has had the most staying power, largely due to its unexpected, widespread use as a striptease theme. Since the '50s it's been used in countless films and on television in numerous burlesque settings; Forrest's recording, or band versions emulating his slow-grind arrangement, have made it the definitive backing track for exotic dancers from coast to coast. In 1962, David Rose hit number one with "The Stripper" in a transparent attempt at establishing a new standard strip song with a brassy, rump-shaking "bump-bump-bump," a rapid-paced counterpart to Jimmy's low notes, and it took over for awhile, but its popularity waned while "Night Train" remained, the classic "go-to" record whenever naughty adult shenanigans are the order of the evening.